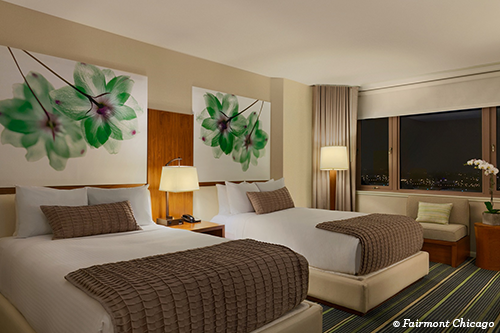 Set within the heart of downtown Chicago, The Millennium Park Connection is made up of four of the city’s leading luxury hotels: Hyatt Regency Chicago; Swissotel Chicago; Fairmont Chicago; Millennium Park; and Radisson Blue Aqua Hotel, Chicago. One meeting concierge provides consistent communication among the neighboring hotels, which together offer 11 restaurants perfect for dine-arounds and networking, 3,700 guest rooms, 370,000 square feet of meeting space, and an indoor pedway connecting all of the hotels’ guest rooms and event venues. The hotels are just steps from some of the city’s top attractions, including Millennium Park, the Chicago Riverwalk, The Magnificent Mile and Navy Pier. As the largest hotel in the city, the Hyatt Regency Chicago houses 2,019 guest rooms and a staggering 240,000 square feet of flexible meeting and event space. The hotel features four ballrooms, 74 breakout rooms, five meeting spaces (designed specifically for small-scale meetings) and the 70,000-square-foot Riverside Exhibit Hall for conventions and trade shows. The Crystal Ballroom, which is the only street-level ballroom in the city, has picturesque views of the Chicago River, Wrigley Building and Tribune Tower. The Hyatt also offers on-site meeting coordinators, catering and smart audiovisual equipment. In June 2016 the Hyatt added 22 new meeting rooms, along with a new common lounge area with a wet bar and a communal table in the East Tower, and communal work stations and a lounge in the West Tower. A new casual restaurant called The Living Room was also added to the West Tower. 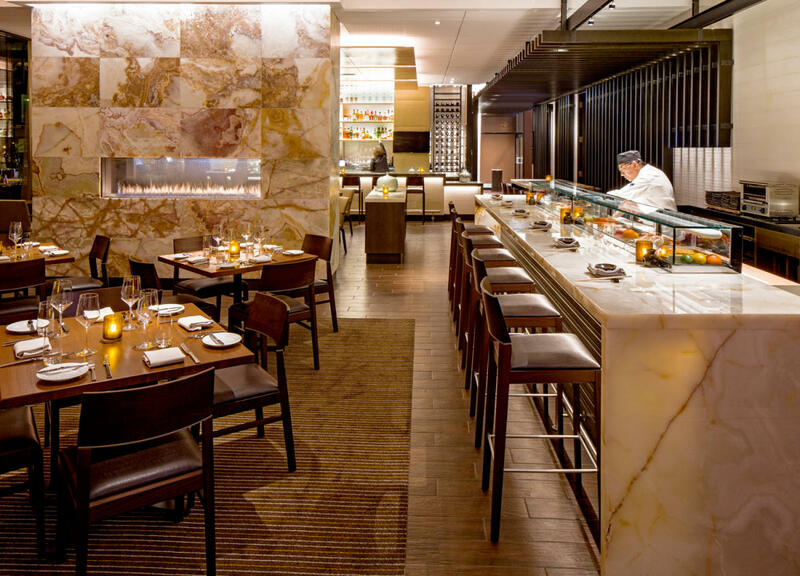 Additional dining includes farm-to-fork fare at American Craft Kitchen & Bar and Stetsons Modern Steak + Sushi. 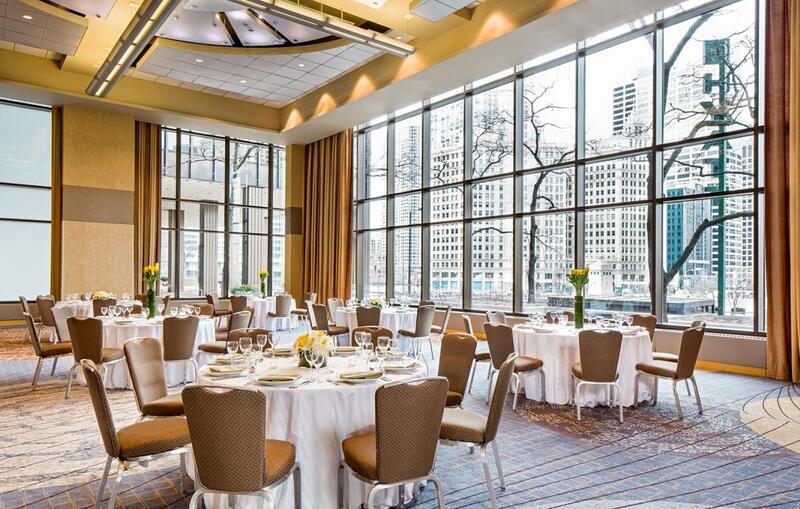 Located on the banks of the Chicago River, the stunning all-glass, 661-room Swissotel Chicago was designed by renowned Chicago architect Harry Weese. The four-diamond luxury hotel offers 65,000 square feet of event space that can accommodate everything from small meetings to large conventions. The crown jewel of the hotel’s Event Centre is the 14,000-square-foot Zurich Ballroom, featuring 17-foot-high ceilings and unobstructed viewing for up to 1,800 attendees. This ultimate meeting space is supported by state-of-the-art technology, fiber-optic cables, high-speed Wi-Fi, and video conferencing facilities with full technical support. The elegant Edelweiss Penthouse on the hotel’s top floor offers banquet seating for up to 150/250 for a reception. 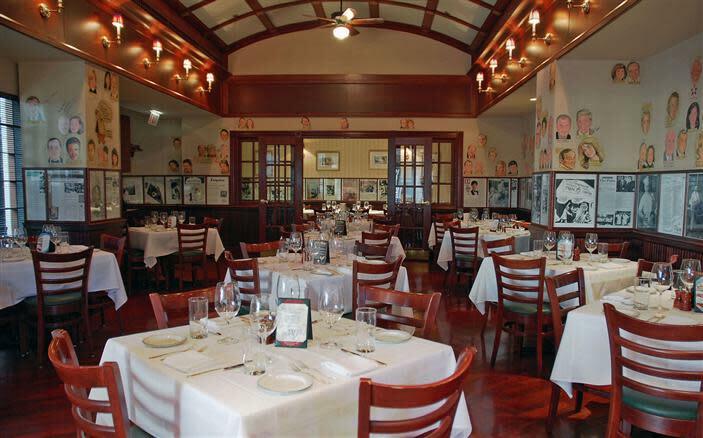 Restaurants include The Palm Restaurant, a legendary eatery known for its prime steaks and Italian fare, along with caricatures of Chicago notables on the wall; and Geneva Restaurant, featuring Swiss and American dishes. The Fairmont Chicago features 687 contemporary guest rooms and suites with sweeping views of Lake Michigan and Millennium Park. 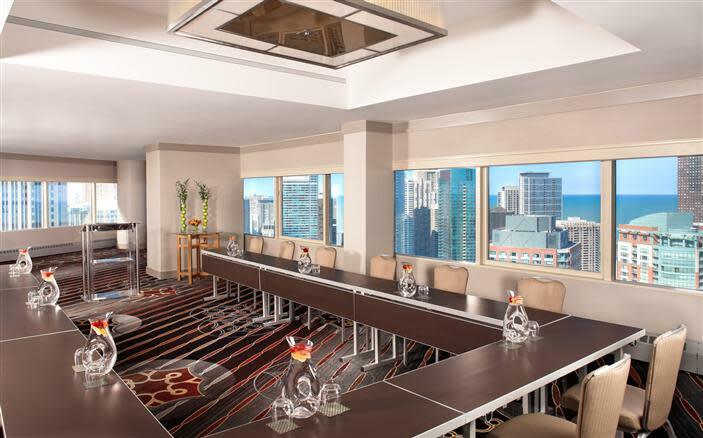 From intimate boardrooms to the Imperial Ballroom offering 16,000 square feet of unobstructed meeting space, the Fairmont caters to functions of every size. The hotel’s 63,000 square feet of venue space includes 15 meeting rooms that can accommodate groups from 20-2,000. Plan a Fairmont Signature Event for your attendees, such as a morning lakefront bike tour or entertainment provided by a comedy improv troupe from Chicago’s famed Second City. 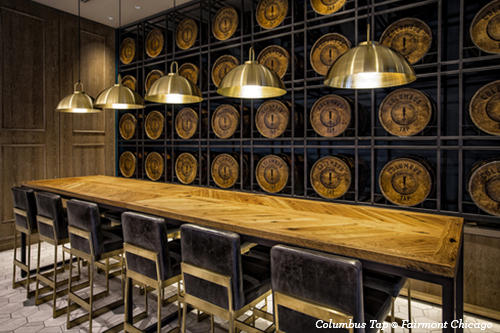 Dining includes gastropub fare in the Columbus Tap and craft cocktails in the clubby THE BAR (which is available for private evening events). Relax after a long day of meetings with a pampering treatment in the 11,000-square-foot mySpa. This sleek 334-room hotel, designed by famed architect Jeanne Gang, features breathtaking views of Millennium Park and the lakefront. 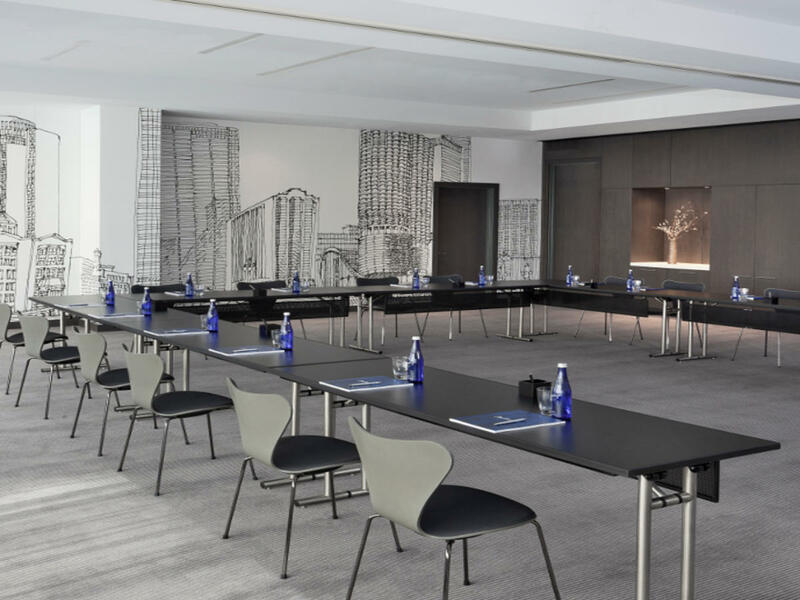 The Radisson Blu offers 28,000 square feet of event space spanning two floors, with 13 flexible meeting rooms that feature built-in screens, projectors and audiovisual support. 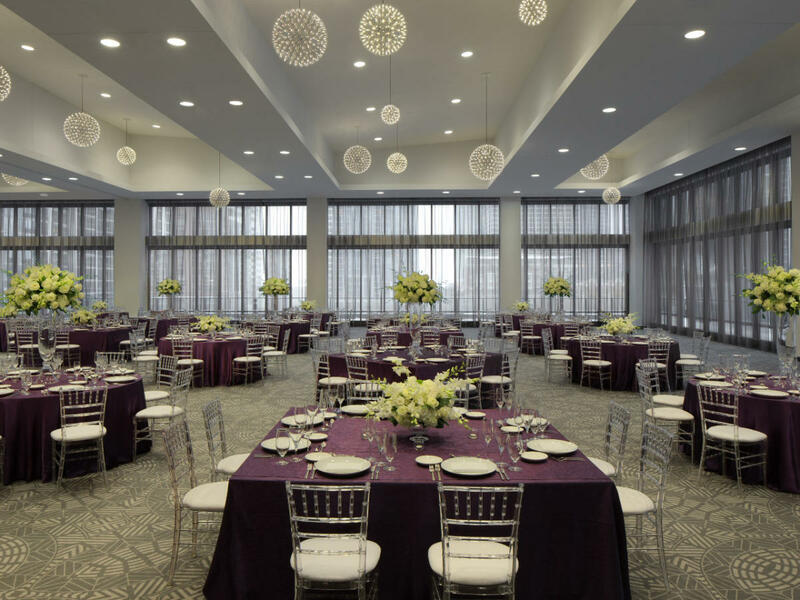 The standout Atlantic Ballroom features floor-to-ceiling windows with dramatic views of the city skyline, accommodating up to 1,650 guests reception-style or 588 for a seated dinner. Plan a reception for up to 200 at Filini, featuring classic Italian dishes and a glass-enclosed wine wall with 100 different selections. In their free time attendees can browse the interesting works in the hotel’s permanent art gallery, or swim a few laps in the rooftop pool and lounge on the sundeck during warm-weather months.